There is a lot of controversy and discussion going on right now in social media about this picture. Two comments stand out: “We want our monsters to look like monsters,” and “this makes him look like an ordinary guy, when he’s not!” So, what is going on in the brain that stirs such passionate discourse over who is on the cover of Rolling Stone? Our brains have evolved to quickly and unconsciously decide who is “us” – that is, who is to be trusted, and who is “them” – that is, who should we watch out for. In the time it can take to weigh the evidence, we can end up eaten. So fast is better, even if it’s not always accurate. When the news of Dzhokhar’s involvement broke, one NPR reporter talked about her personal connection with him – He was a friend of her nephew’s; she had been there for her nephew’s gang’s “pre-prom” photo shoot; she was sure she had pictures at home that included him. Her mind was boggled to take in this news. I resonated with this: I’ve been pouring over brain research to find out what happens to our brains when the “them,” that is, the “bad” guy, becomes “us,” that is, when we find out that it’s someone we know. See the side note to this blog, referring to a potential book, titled, “The psychopath who came to dinner, and other tales of fear and faith?” I have a personal interest in this question – And in how Dzhokhar’s peers, teachers, friends, acquaintances, didn’t see this coming. It’s because my husband’s cousin, while thankfully not hurting anyone outside the family, did kill his father, his mother, then himself. And I watched our family, and my own brain, try to grapple with these two seemingly contradictory statements: Nothing about John would have made me guess this, even in retrospect; and yet John did this. Our brains don’t like contradictory facts. It sends us into a tailspin. Our brains like neat categories, black and white distinctions, simple answers. Remember, our brains like to conserve energy, and take familiar roads through established neural pathways. “Cognitive dissonance,” as represented here, is like asking us to divide our bodies and go down two different roads at the same time. It feels impossible. So, we want our good guys and bad guys to be distinguishable at a glance. 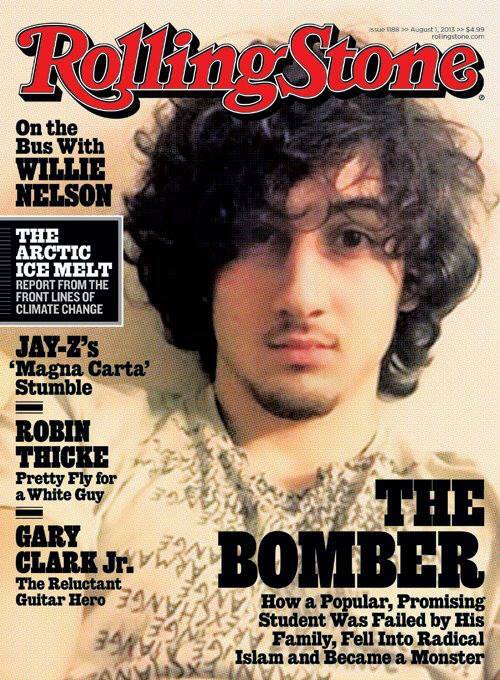 I’m glad Rolling Stones put Dzhokhar on the cover, if only because it reminds us that our brains are fallible; if it looks like a duck and walks like a duck, it isn’t always a duck, even though our brains will lazily see only what they are primed to see, until challenged. This cover photo challenges us, makes us pause, and question, what do we know, how do we know it, why do we know it. Why does it make us so uncomfortable? What is going on inside our brains? Can two things be true at the same time: He was a normal young man, AND he did this awful thing? As hard as it is to wrap our minds around, literally, both can be true, as much as it boggles our brains. Amy, this is such a right-on post. I’ve been struggling with this issue since last year. Thanks for writing an amazing blog! Always thought-provoking! Thanks Amy! I have been catching up on some of your posts and have already shared your helpful explanations with others. It is so great the way you take everyday kinds of feelings and behaviors that are less than helpful and explain them and then to boot provide some new tools!